manila fashion observer: Ready For Rain's Summer Sale! Ready For Rain's Summer Sale! The best bargain hunters know that the best time to shop for clothes and accessories is off-season! So, forget the summer heat and keep in mind that rainy days will come in time! 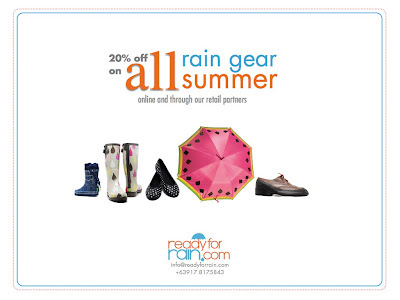 Buy your rain gear now at ReadyForRain.com while everything is 20% off!! !